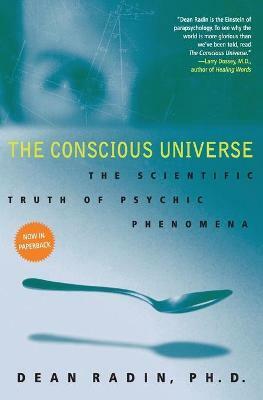 This myth-shattering book explains the evidence for the veracity of psychic phenomena, uniting the teachings of mystics, the theories of quantum physics, and the latest in high-tech experiments. With painstaking research and deft, engaging prose, Radin dispels the misinformation and superstition that have clouded the understanding of scientists and laypeople alike concerning a host of fascinating oddities. Psychokinesis, remote viewing, prayer, jinxes, and more--all are real, all have been scientifically proven, and the proof is in this book. Radin draws from his own work at Princeton, Stanford Research Institute, and Fortune 500 companies, as well as his research for the U.S. government, to demonstrate the surprising extent to which the truth of psi has already been tacitly acknowledged and exploited. The Conscious Universe also sifts the data for tantalizing hints of how mind and matter are linked. Finally, Radin takes a bold look ahead, to the inevitable social, economic, academic, and spiritual consequences of the mass realization that mind and matter can influence each other without having physical contact. Director of the Consciousness Research Laboratory at the University of Nevada at Las Vegas and twice president of the Parapsychology Association, Dean Radin, Ph.D., has done cutting-edge parapsychology research for AT&T, Stanford, Princeton's Engineering Anomalies Research Lab, the University of Edinburgh, S.R.I. International, and the U.S. Government. He lives in Las Vegas, NV.